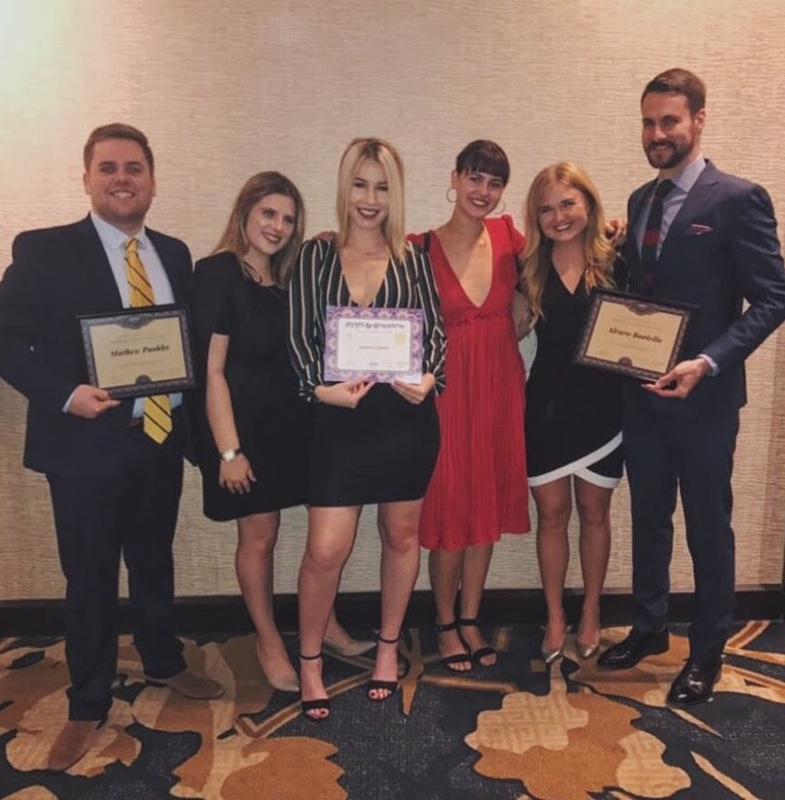 Pictured from left to right, with their respective awards: Matt Pasby (Firm Director), Olivia Rosing (Creative Director), Sidney Conklin (Creative Associate, Fall 18), Bridget Burkley (Assistant Director), Lily Cummings (Assistant Director), and Álvaro Bootello, Ph.D. (Executive Director). · Silver ADDY, the Shawn M. Donnelley Center for Nonprofit Communications. Direct Marketing, for the New Orleans Bulldog Rescue 2019 Calendar. · Ad Person of the Year, Student: Matt Pashby (PR, '19, and Student Firm Director, the Shawn M. Donnelley Center for Nonprofit Communications). · Ad Person of the Year, Educator: Álvaro Bootello, Ph.D. (Chair, Department of Strategic Communication, and Executive Director, the Shawn M. Donnelley Center for Nonprofit Communications). Loyola University New Orleans' student-run and full-service communication agency, The Shawn M. Donnelley Center for Nonprofit Communications, has for more than 20 years helped New Orleans-based nonprofits achieve success. Having served more than 300 clients since its inception, the Donnelley Center provides completely free hands-on public relations, advertising and design services, giving undergraduate students from across the university real-world experience in the communication field. Clients have ranged from the Tipitina's Foundation to Second Harvest Food Bank. Led by Dr. Álvaro Bootello, Chair of the Department of Strategic Communication at Loyola, the Donnelley Center helps nonprofit clients devise creative communication solutions with services including social media, event planning, media relations, graphic design, branding, videography, photography, strategic planning and content editing. “The Shawn M. Donnelley Center for Nonprofit Communications is a one-of-a-kind operation in which strategic communications students at Loyola University New Orleans serve as practicing professionals, helping nonprofit clients benefiting the community as they grow their skills, their networks, and their resumés. The ADDYs reward the creative spirit of excellence in our field, and elevate our students work to the highest industry standards, proving their complete competence and preparedness for the professional world,” Bootello said.